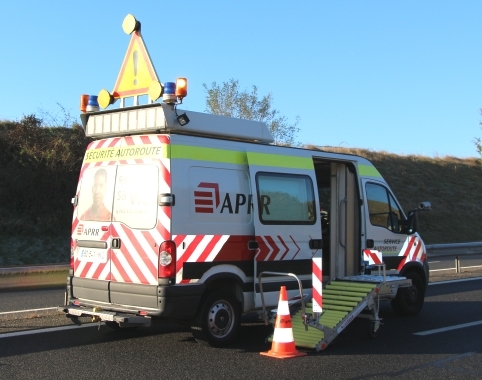 Developped by Optomachines in partnership with APRR (French motorway company), the Baliseur brings an ergonomic and safe solution for laying and retrieving standard road traffic cones. – The worker remains protected inside the van. He doesn’t need to lean out of the van. – The cones are delivered at the right heigth to be lifted, so that the worker doesn’t need to lean to lift the cones. The system reduces drudgery of work. – The Baliseur features reflective white and red stripes to enhance visibility. – Seen as an extension of the vehicle, visible and permanently present on the road, the Baliseur keeps the traffic away from the worker. 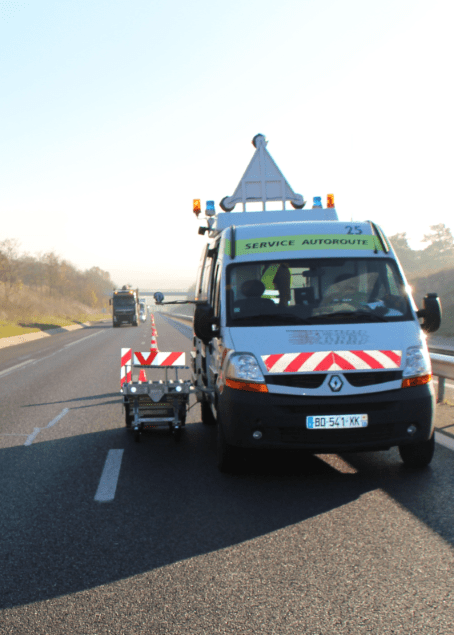 – A camera and 2 monitors help the driver and the worker to have a good visibility of the traffic even at night. 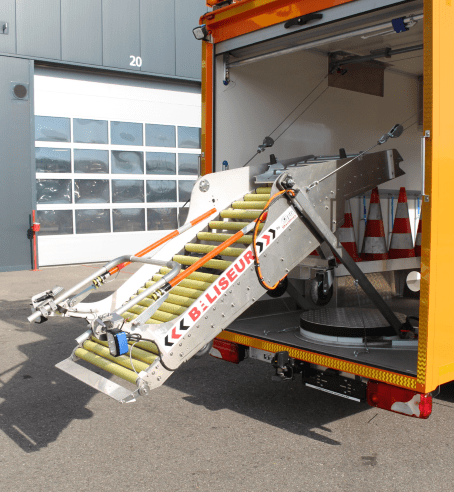 – The Baliseur drops effortless on the road thanks to a motorised lift. – The mechanical systems are simple and easy to use. Dedicated to standard traffic cones of 75 cm. ♦ electrical and electronic components. Originally developped to be fitted in vans with sliding lateral doors, the system is also available in rear configuration for vans with a large back doors.